I've managed to buy myself a rather nice used SuperQuartz Chopard Chrono, which worked great when I got it (all buttons and features appeared to work fine). After playing with the features some more, the bottom pusher decided not to work any more. The button will press, but nothing happens. Since the bottom pusher is pretty key to setting the exact time, resetting the chrono, etc., it's a bit of a pain (esp. when it's 40 seconds off right now). As this is a very similar movement to the Breitling SQ movement, I was wondering if anyone had any experience of this problem. Judging by the overwhelming response rate, I'm guessing that no-one here has had this issue! As the pusher still works it's clearly a movement/circuit-board issue (as opposed to a mechanical issue with the pusher). It'll have to go back to Chopard for repairs. Yes, the said watch has now gone off to Chopard for assessment and hopefully repair. Hopefully it'll just be a mechanical issue or a defective microswitch. If the whole movement needs replacing, I won't be that happy. Oh well, at least I have my other 19 or so watches to fall back on. Yes this is the same exact ETA sourced thermocompensated movement used in the B1, Airwolf and Chronospace aka Breitling Caliber 78. The difference with the version used in the Chopard Time Attack MF is that it uses a single 2 line LCD screen instead of the 2 separate screens often found in the Breitling versions. The Chopard is a great piece and for years tried to locate one with the steel bracelet. But not many were made since its 2011 debut and most local Chopard dealers did not carry and were unaware of its existence until I pointed out in their own ordering catalog. Since Breitling came up with their own in house SQ multifunction movements in the B50/B55 in 2014/2015 respectively, lost interest in the Chopard. I had also owned for about a year a beautiful LE Airwolf so I felt I had scratched that itch already. 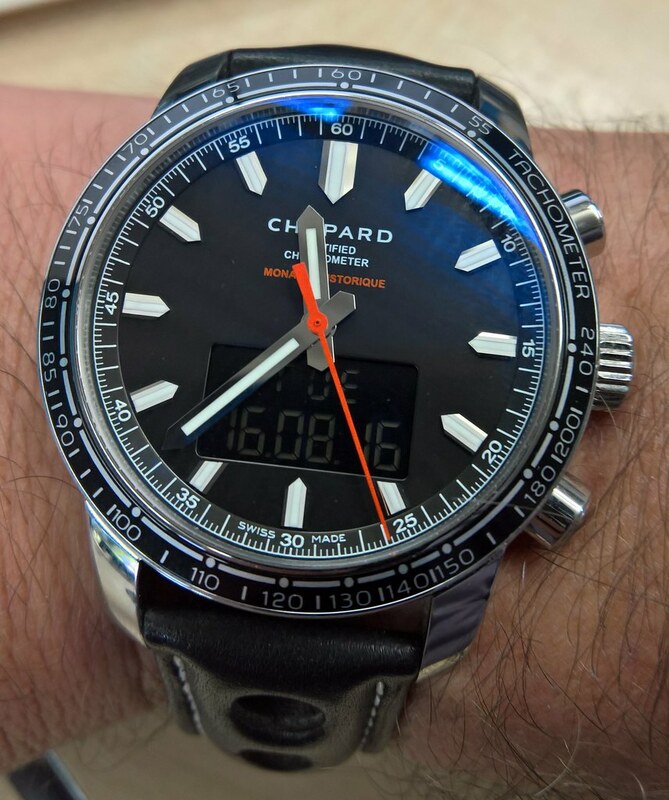 Technically Chopard should be able to fix the pusher for you for a fee of course or a reputable independent that is well versed with This type of higher end Quartz Swiss watch. Ensure that your independent has access to Chopard parts of need be. Servicing concerns and this being the only Quartz offering in Chopard's catalog (Perhaps discontinued by now) may me shy away from it ultimately and stick with the better known and far easier to service Breitling offerings. The Time Attack MF is rare and a gorgeous watch nevertheless. There is nothing scientific about the pusher. It is just a contact point against the electric contact on the side of the movement. Hopefully should be a quick repair. Ensure that they also replace the gasket for that pusher. The free sprung rotating crown is far more complicated and you don't want that damaged. However, these crowns seem to be very reliable on the ETA movements. I would be shocked if you would be asked to replace the movement over this. The Breitling SQ chronos, such as the Colt Chrono II, had the ability to have the minute hand/second hand offset for timing things such as yacht race countdowns, etc. The manual indicated how to reset the position of the center chrono hands by using a particular sequence of pushes on the top and bottom chrono buttons. Is it possible you might have triggered this function while using the chrono/ Check your manual if you have one.